(Photo: LWF / Allison Westerhoff)Evangelical Lutheran Church in Tanzania Presiding Bishop Alex G Malasusa (centre), with some of LWF Council members on May 20, 2015. Tanzania's Bishop Alex G. Malasusa has inaugurated African Lutheran anniversary celebrations with a call for greater unity among the churches adding to those at the meeting seeking more inter-faith efforts to counter violence in the name of religion. Speaking at the Moshi Lutheran Cathedral, he expressed joy at African churches hosting the upcoming Lutheran World Federation 12th assembly and the 500th Reformation anniversary in 2017 in Windhoek, Namibia. 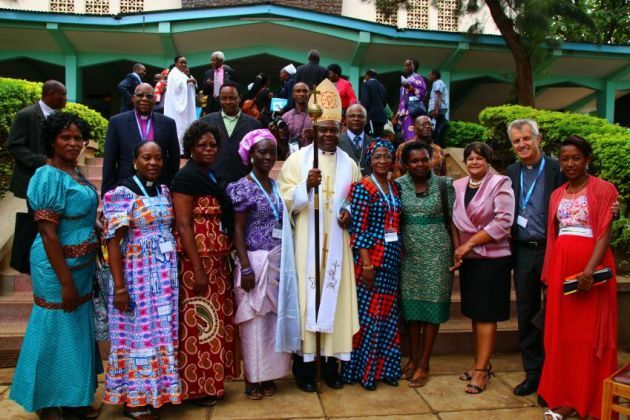 The current Marangu meeting symbolizes "African happiness that the most known Reformation anniversary will be taking place on the soil of Africa," said Malasusa, presiding bishop of the Evangelical Lutheran Church in Tanzania. In his May 20 address during the opening worship at a gathering to celebrate the first meeting of all-Africa Lutherans in Marangu, Tanzania, 60 years ago he said there are signs that Africa is changing. A vice-president in the LWF, which represents 72 million Lutherans worldwide, Malasusa encouraged churches to honor and acknowledge such progress, Lutheran World Information reported. He cited pioneer Africans like Kwame Nkurumah, first president of Ghana who ignited the vision of uniting Africa. He noted that Nelson Mandela, the first president of South Africa's after end of apartheid was an outstanding role model, who lived Jesus' teaching of "loving our enemies and praying for our prosecutors." Still, Malasusa said, there are major challenges facing Lutherans in Africa as a growing church. The themes that will be discussed in the conference: "creation is not for sale," "human beings are not for sale" and "salvation is not for sale" need special attention. Malasusa urged LWF churches on the African continent to revitalize the Reformation spirit in anticipation of the 500th Reformation anniversary in 2017 and beyond. "As Lutheran churches in Africa, we need to reach people rather than people reaching us. We need to have a strong base of diaconal activities at the grassroots level," said Malasusa. At the meeting LWF general secretary, Rev. Martin Junge called on African Lutheran churches to use their sense of "togetherness and strength" to advocate for justice, peace and reconciliation in the continent. He was speaking on May 20 at a gathering to celebrate the first meeting of all-Africa Lutherans in Marangu, Tanzania, 60 years ago. Junge said the conviction that "being together means being stronger" was the impulse for the historic gathering in 1955, in Marangu. He expressed his growing respect for the pioneer Lutheran church leaders. Junge noted they defied the strain and burdens of pre-independence Africa to make Marangu the birth place of "a unique togetherness" of Lutheran churches on the continent. The Evangelical Lutheran Church in Tanzania is hosting the May 20-24 Marangu anniversary meeting, taking place during the Africa Lutheran Church Leadership Conference. Participants include some 200 delegates from the 31 LWF member churches in Africa and global Lutheran leaders, representatives of mission partners and invited ecumenical guests. On salvation, Junge said there is a general opinion that there is something wrong with the notion of "prosperity gospel." He encouraged Lutheran churches to make a distinction between the concept of "prosperity" and "life in abundance" as explained in the Gospel of John. The latter emphasizes solidarity and the dignity of every human being including those who are poor, sick and marginalized. Junge commended the African Lutherans for their collaboration with other churches and faith communities on the continent. However, he called for more attention to interreligious tension in the face of new dimensions of violence that is perpetuated in the name of religion. "We should not be derailed in our interfaith efforts," Junge said. "Let us not allow extremism to claim the space to define what faith and religion is all about."